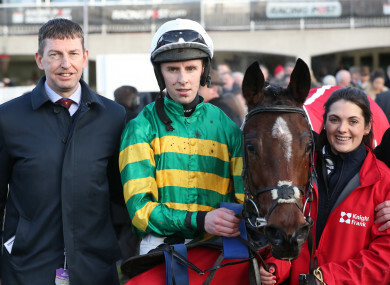 Gavin Cromwell with Espoir D'allen and jockey Mark Walsh. KILKENNY HURLERS AT their peak were something else – too good, indeed, for a bulk of the masses. You’d be ensconced in the Upper Hogan, or wherever you stumbled into a ticket, possibly looking at glum Galway faces for whom the famine would seemingly go on forever. By the time the captain got his chance to grasp Liam MacCarthy again, the atmosphere was bordering on sterile. For all that these hurling warriors give for nothing in return bar the love of the game, it was a disservice that so many would make their way out of Croke Park before the presentation. Simply, like it or don’t, people were bored of their dominance – much like that of Dublin footballers’, edging towards the territory of resentment at this stage. We love an underdog in Ireland and Leopardstown must have been heaving nearly 22 years ago when Danoli won the Hennessy. As Grade 1 winners go, there was little extraordinary about Danoli, but the racing public adored him like the family pet who always wanted to be by your side. Danoli, which commentator Tony O’Hehir would hail as “The People’s Champion”, beat Jodami and Imperial Call in the 1997 Hennessy. He was ridden by a journeyman in Tommy Treacy. “I get hairs in the back of my neck thinking about the reception he got that day. Till the day I die I’ll never forget it,” Treacy told me in 2014. His trainer, Tom Foley, is one of the nicest people I’ve had the fortune of meeting in any walk of life. He could be your neighbour and more luck to you if he is. His owner too, to quote WB Yeats, was a wise and simple man. Danoli was an underdog and, for all that the achievements of Willie Mullins, Gordon Elliott, JP McManus, Michael O’Leary and Ruby Walsh are simply staggering, their success in the sport makes many pine for an upstart too. Gavin Cromwell may have described himself as a farrier who trained horses when he had chance. He was long known in the game for the reason that set him apart from other trainers – that and the fact that he was close buddies with Gordon Elliott. They spent time in the US together, though they may filter the stories recalling enviable lives as young Irishmen abroad. Having shoed Olympian, Gold Cup and Grand National-winning horses, he took out a training licence in 2005 – but would make minimal enough impression until recent years. The improvement is staggering. In Cromwell’s first nine seasons, he managed just seven jumps winners, This season, and we are only in January, he has already racked up 31. And he has made his mark on the Flat too. Over the two days of Paris’ Prix de l’Arc de Triomphe weekend, one of the biggest festivals in the world, the Irish managed a solitary winner last year. It was trained not by Aidan O’Brien, nor Dermot Weld, nor Jim Bolger – but Gavin Cromwell. Feidhlim Cunningham, having spent several years working in bookmaking, joined the yard last year to assist him with planning races for his burgeoning string. “He’s improved almost everything he’s gotten,” says Cunningham. “And every top-class animal he’s had through his hands have fulfilled their potential in both codes, from Grade 1 winner Jer’s Girl (his first runner for JP McManus) to Raz De Maree (who won the Welsh Grand National at the age of 13) to Princess Yaiza (the Paris winner) to Espoir D’allen (more on him shortly). Ger Fox has more reason than most to thank Cromwell. In late 2017, the Irish National-winning rider got banned after testing positive for cocaine but Cromwell stood by him. At his hearing, the relevant committee noted a letter from Cromwell, for whom he worked as assistant trainer during his suspension. ‘”He stood behind me all the way,” Fox says. “The operation is better than ever. Most trainers are giving up; he is expanding all the time. He is very loyal and fair, no airs or graces about him. “He is very fair to an owner. If the horse is here after a couple of months, he tells the owner straight: forget about it. That’s what owners want, that a trainer is not wasting their time and money. Through talent and toil, Cromwell has added JP McManus to his list of owners, and McManus sent him Espoir D’allen, emerging as more than a lively outsider for the Champion Hurdle at Cheltenham in March. This bonny horse makes the next step in Naas’ big race on Sunday, his trainer starting to dream. Before that, Maid In Manhattan is around 12/1 to win tonight at Dundalk in the 5.30. This mare has been unfortunate with slowly-run races conspiring against her. She looks a pretty huge price this evening. Back to Naas on Sunday, Chris’s Dream faces a tough challenger in Ballyward in the Naas Racecourse Business Club Novice Steeplechase (2.20), but he can prove up to the task. By then, Cromwell will know if a Champion Hurdle bid with Espor D’allen looks avaricious. That race, the Limestone Lad Hurdle, honours a horse that was a perfect upstart, teak-tough and trained in a tiny yard for James Bowe in rural Ireland. Limestone Lad was loved by the Irish public. When Cromwell invites the masses to his first yard open-day next month, there will be no shortage of animals fighting for their affection. Not bad for a farrier. Email “We love an underdog and Cromwell could provide one with Champion Hurdle hope”. Feedback on “We love an underdog and Cromwell could provide one with Champion Hurdle hope”.